Although the Hili family has issued bonds on other occasions in the past, few investors associate them with the IT sector. In fact, PTL Holdings plc was only established in December 2013 as the holding company of the technology division of Hili Ventures Group. The IT arm of the Hili Ventures Group was created through a series of acquisitions initially with PTL Limited (formerly Philip Toledo Ltd) in 2012, followed by SAD in June 2014 and APCO in August 2014. Hili Ventures is owned by Melo Hili (50%) and the other 50% by his brother Beppe Hili and other members of his family. It is worth clarifying that while Premier Capital plc (the franchisee of McDonalds) is also owned by Hili Ventures and consequently it is the sister company of PTL Holdings, Mariner Finance plc does not form part of Hili Ventures as it is owned by Marin Hili and his immediate family. PTL Holdings plc is issuing €36 million in unsecured bonds due to mature on 4 December 2024 carrying a coupon of 5.1% per annum. The proceeds of the bond issue will be used to repay bank loans and other short-term borrowings taken out to finance the recent acquisitions of SAD and APCO. SAD was originally set up in 1991 and bought by the PTL Group in June 2014 for €40.35 million. The company operates 22 Apple stores in various cities across Poland under the iSpot brand through a non-binding, non-exclusive Apple Premium Reseller (APR) franchise agreement with Apple Inc. SAD is the largest retailer of Apple in Poland. As an Apple Premium Reseller and Apple Authorised Service Provider, SAD offers a full range of Apple products (including software and accessories) and support and repair services to customers. SAD competes with other resellers of Apple products and services in Poland, and therefore the main competing factors are not price or quality of products, but location of stores, quality of service provided and share of the business-to-business market. From discussions with PTL, it emerged that SAD’s main competitor which runs 10 stores branded iDream is located in smaller cities and in more remote locations. Although PTL acquired SAD in July 2014, the Prospectus and the Financial Analysis Summary provide key financial figures for the last three financial years. Between 2011 and 2013, total revenue generated by SAD doubled from €38.6 million in 2011 to €77.3 million in 2013. While retail sales increased by 44% from €30 million to €43.4 million primarily as a result of 2 new store openings in 2012 and 5 new stores in 2013, the largest growth came from the corporate sector with overall revenue surging to €31.6 million in 2013 from only €6.9 million in 2011. SAD generated total EBITDA of €3.5 million in 2013 compared to €1.2 million in 2011 with the EBITDA margin improving from 3.2% in 2011 to 4.5% in 2013. APCO was originally set up in 1987 and bought by the PTL Group in August 2014 for €8.8 million. APCO provides electronic payments transaction processing services to retailers and internet-based merchants and operates under the brand name APCOPAY. Moreover, APCO is a supplier of ATMs, point-of-sale (POS) terminals, plastic cards, deposit machines, currency exchanges, automotive fuel payment systems and other cash-handling equipment. The recent financial performance of the APCO Group has been volatile as a number of merchants terminated their service in 2013. Despite this, the APCO Group is still a profitable operation with significantly higher margins than the other business units of the PTL Group. SAD currently contributes the large majority of the PTL Group’s revenues and earnings before interest, tax, depreciation and amortisation (EBITDA). This dependence is likely to be maintained also in the immediate future as the 2015 projections indicate that SAD will account for over 80% of total Group EBITDA estimated at €7.5 million. As such, PTL Holdings is largely dependent on the SAD business model which in turn is reliant on the Apple brand. Investors should therefore understand that this bond issue is strongly linked with SAD’s ability to maintain its franchise relationship with Apple and more importantly, Apple’s ability to remain at the forefront of the technology industry by rolling out new products in line with customer expectations. The Financial Analysis Summary annexed to the Prospectus indicates that the current smartphone penetration in Poland at 33% is well-below other markets with penetration rates exceeding 70%. Moreover, only 4% of smartphone users have opted to acquire an Apple product with the large majority selecting Android based phones. This is the biggest growth opportunity for SAD as penetration should increase in the near term provided Apple continue to maintain the lead in creativity and innovation, in which case it is bound to win a higher share of the smart phone market. In fact, SAD is planning to systematically open a number of new stores in the coming years to consolidate its position as Apple’s largest distributor in Poland. SAD aims to increase its iSpot complement from the current 22 stores to 31 stores with 3 new outlets planned for 2015, another 3 in 2016 and the balance in later years. However, the research study referred to in the Financial Analysis Summary indicates that consumers in Poland are very price conscious and this is the reason for the significantly higher market share for the cheaper Android-based phones. This is quite a challenge for SAD and other Apple resellers given the emergence of cheap Chinese phone manufacturers using the Android operating system. During the recent meeting with financial analysts, the top management of PTL shared some key figures of their 3-year business plan. Total revenue of the PTL Group is estimated to increase from €117 million in 2015 to €145 million in 2017 and EBITDA to surge to €10.8 million from an expected €7.5 million in 2015. Since the projections for 2016 and 2017 were not published in the Prospectus, no details are available on the assumptions behind these key figures. However, given the fact that the Group’s EBITDA margin is still expected to remain low at around 7.4%, it implies that SAD will continue to generate the lion’s share of future revenue and EBITDA. This is likely to arise from the additional iSpot stores due to open in 2015 and 2016 and the Apple product pipeline with the recent launches of the new iPhone and iPad as well as the revolutionary Apple Watch due to hit the market in the early part of 2015. 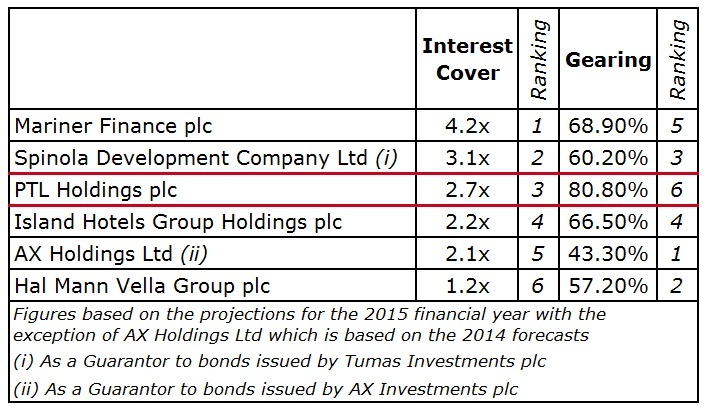 PTL Holdings is expected to have a strong interest cover of 2.7 times in 2015 and management indicated that this should stabilise at around 3 times during the remaining term of the bond. However, PTL is among the highest leveraged companies among local bond issuers with a gearing ratio of 86% in 2014 (shareholders’ funds of €7.5 million compared to net debt of €46 million). Assuming Apple products will continue to remain in strong demand and smartphone penetration in Poland increases, SAD should manage to achieve its financial objectives. In turn, this will lead to an improvement in the gearing ratio of PTL to 61% in 2017 as bank borrowings are reduced and profits will be retained within the company. The expected strong cash generation from PTL, mainly through SAD, if Apple remains at the forefront of the technology industry, should lead to a cash buffer of over €20 million by 2024 after the repayment of all borrowings. This should comfort prospective investors. On the other hand, investors ought to note that while most local companies have a high element of property as assets on their balance sheet (and at times these are used as security for bondholders), PTL has very little property holdings as all Apple outlets are leased from owners of shopping malls. 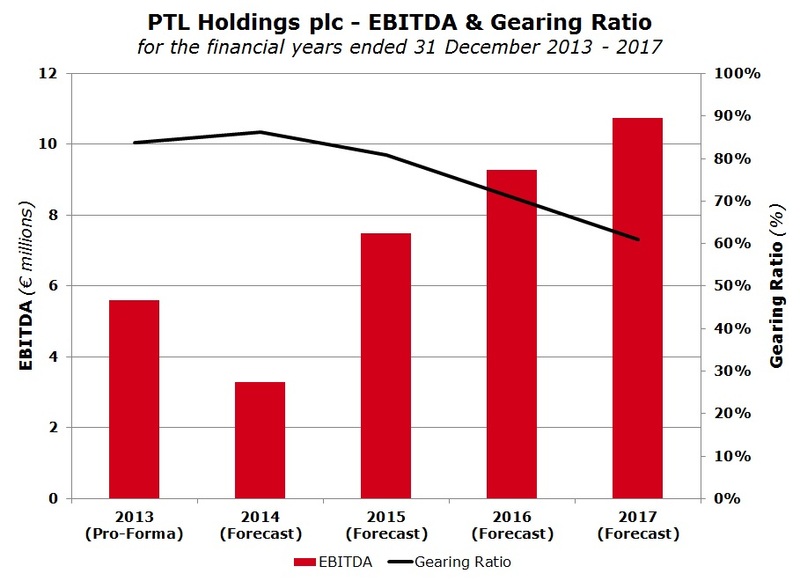 The large majority of assets on the balance sheet of PTL Holdings is goodwill arising from the recent acquisitions of SAD and APCO. Given the shareholding of some members of the Hili family and PTL’s association with one of the most valuable brands coupled with the increasing levels of liquidity among local investors, this bond issue is also expected to be heavily oversubscribed similar to other bond issues this year. Investors should note that other bond offerings are expected in December and throughout 2015 offering a variety of options to place their idle cash resources. However, investors need to understand the different business models of issuers coming to the market to ensure a proper understanding of the risks associated with each issuer. Detailed information and guidance from issuers is therefore essential to assist financial analysts in guiding the investing public accordingly.